LOS ANGELES - Tom Petty was walking under a particularly gray cloud for a long time. In 1985 he broke his hand in anger during the recording of his darkly colored "Southern Accents" album. In 1987 his hillside Encino home was destroyed by fire. That same year he sued tire manufacturer B.F. Goodrich for using music in its commercials which sounded like his song, "Mary's New Car." After a restraining order was issued, the ads were pulled. Throughout much of that time Petty admits he was drinking too much and that the whole period was one of frustration and confusion. "Those things are always interesting to read about unless it's you," Petty said, smiling. "Then you read about it and think, 'Geez, that's me.' I hope I'm over all that." Coming out of his collaborations with Roy Orbison on the late singer's "Mystery Girl" and the superstar Traveling Wilburys sessions - featuring George Harrison, Bob Dylan, Jeff Lynne, Orbison and Petty - the singer-songwriter has released his first solo album, the lighthearted "Full Moon Fever." He recently was the musical guest on NBC-TV's season-ending "Saturday Night Live" and his first U.S. tour in two years - with his backing Heartbreakers - begins this summer. Petty's working vacation began after meeting producer Lynne in London and later in Los Angeles. "We just got along really well," Petty recalled. "I wasn't in the mood to make a record. I wasn't even thinking about making one. We thought we could do it real fast. I told the Heartbreakers, 'Look, I'm going to make a record' and they weren't planning to do anything at the time. I said I could be done with it in a few months. Of course, I wasn't. One of the intrusions was the Traveling Wilburys - a one-song project that mushroomed into a self-titled platinum album. 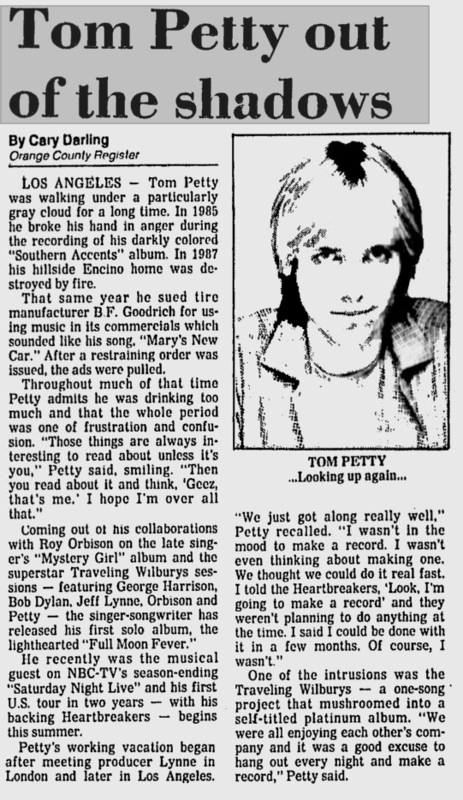 "We were all enjoying each other's company and it was a good excuse to hang out every night and make a record," Petty said.